In her pitch, Katrina talks about a multi-channel communication strategy that incorporates both traditional marketing channels (print, tv, radio) with new-age digital marketing channels (website, videos, sms, etc.). Sounds good in theory but how does one go about executing this? One easy and affordable technology tool that churches should definitely employ is the QR Code—a bridge between the physical and online world. A QR Code is a square-shaped barcode that can store information such as website links, text, and contact information. Such a code can easily used in promotional campaigns. And can be read using a QR Code scanning application on a smartphone, which everyone carries with them these days. QR Codes can easily be created using online QR Code management tools. First things first. It is important to understand that QR Codes go on physical or print media. Churches normally market themselves with the following print creatives – flyers, sandwich boards, signs, mailing newsletters, and newspaper/magazine ads. Why should I visit a church? How can it help? What are its key beliefs? What is the architectural significance of the church building? People in your local community will have these questions. 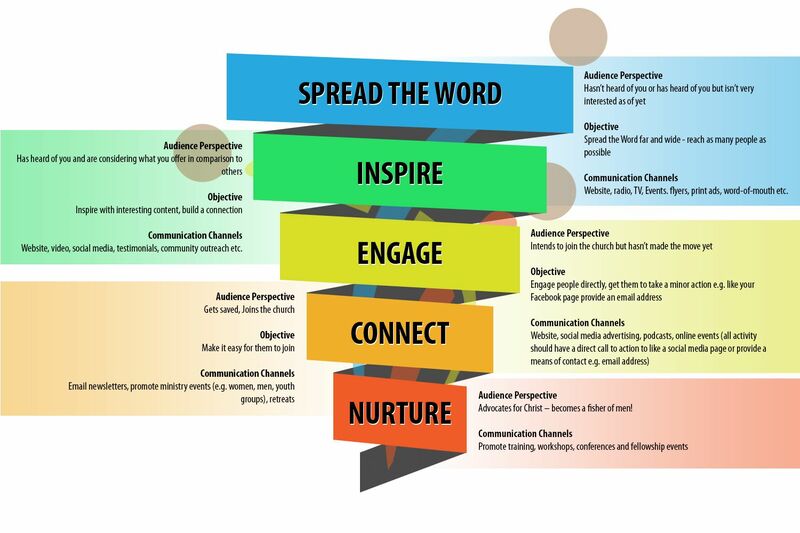 If these questions are answered in a timely manner, these people are more likely get inspired (See Inspire in marketing funnel image). QR Codes that link to pages on your website will ensure that people can access the information at anytime even if you are not there to personally meet them. The Church of Jesus Christ of Latter-day Saints in Mesa, Arizona, US, is a good example here. As a part of their Christmas decorations in 2015 and 2016, the Chruch added 8 QR Codes spread across their lawn. The QR Codes will link to short videos on Church’s website. You personally engage with people via Sunday services, meetings, seminars, and counselling sessions. While personal engagement is best form of marketing, is it enough? In these busy times, people need reminders. They need to regularly engaged – bit by bit – to form a deeper connection. In this digital age, this role is played by social media. So you don’t just want believers to follow your church but you also need to get them to follow you on social media platforms such as Facebook and Twitter. This way they can get updates, listen to sermons, discuss, and make donations if they are not physically available. 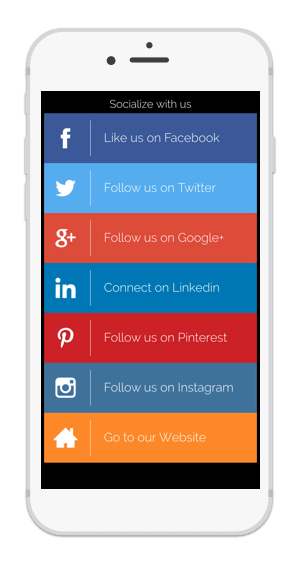 So what can you do increase your social media following? Add a Social Media QR Code on your print media. When scanned, a Social Media QR Code opens a mobile-optimized page that has links to all your social media profiles. This way people get an option of choosing the platform they are most active on. It is no secret that church attendance is on a regular decline. People are getting busy and for many it is not possible to dress up and visit church on Sundays. Does this mean they don’t want to listen to your last sermon when they get newsletter? 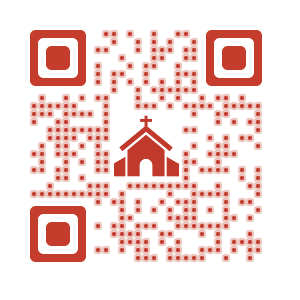 If your church records a video or audio of the sermons, then you can distribute them via print media using QR Codes. You can upload the video for free on Youtube and create a Youtube QR Code. 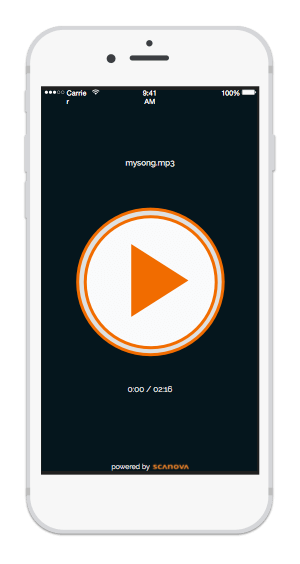 Or you can upload the audio on Scanova, and create an Audio QR Code. If you are running a fund-raiser campaign for the church or one of its activities, then you can add a Paypal QR Code to your flyers, newspaper ads, or mailing newsletters. When scanned by your followers, they will be able to easily make a payment using their smartphones. If you don’t use Paypal, you can simply add the payment link from any other service in a Website QR Code. Are you organising an activity and need volunteers? Get people to signup digitally by proving a link to an online form (Google Forms). You can create a free form using Google Forms, and paste the link in a Website QR Code. In your activity promotional material, you can request people to volunteer by scanning the QR Code. When the QR Code is scanned, they will see the Google form. They can provide necessary details and submit the information to participate. These are my top suggestions on how you should use QR Codes in your church marketing strategy. If you are creative, you can come up with your own use cases to connect your offline promotions with online engagement to connect your offline promotions with online engagement to connect your offline promotions with online engagement. By the way, did you know there are 23 different types of QR Codes? Generate a visually-appealing and dynamic QR Code for your marketing campaigns to attract and engage more followers.